Boca Raton, Fla. (November 26, 2012) – It all went by so quickly, not only this amazing opportunity in the UK but this whole entire year. I’m sad it’s all over. 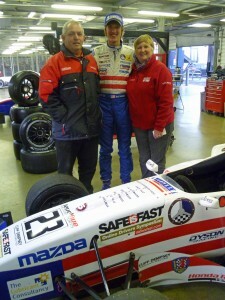 I had so much fun in the UK with the Dempseys and racing in the Formula Renault Team USA Scholarship car. I’m now looking forward to getting back home, however I loved it over there, and hopefully I will cross paths with some of the fantastic people I met there in the future. It was definitely a lot tougher than I expected and it was quite a steep learning curve but I really enjoyed the experience and the challenge. Photo by courtesy of Paul Davies. It was tough to come to grips with the car and racing in England. It definitely took a lot longer than I expected, even though it wasn’t too different from the USF2000 car. 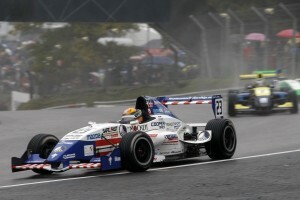 The Formula Renault car had a lot more grip mid-corner but the power wasn’t too different. I guess it was tough to compete against the drivers racing in the cars for the whole year. Everyone was always so close, and if you didn’t have everything perfect, whether it was the driver or the car, it really showed. It was truly amazing how many drivers there were all fighting for the top step with a good chance. I think they take their racing more seriously over in England and Europe. Everyone was out there to win and didn’t care about anything else at all. It was amazing how into racing they were as well – they eat and breathe motor racing and it was incredible how many people were spectating at the races. 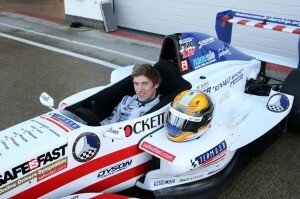 My first race was at Silverstone, which was the last race of the BARC Formula Renault Championship. I started off really well and I was close to the pace straight out of the box. All through practice it was relatively dry for a change, so I was fortunate to get some great track time running with the other people. I qualified fifth and was extremely happy because I was within a tenth of getting on the front row. It was tough racing against these guys for the first time, but I managed to finish sixth which I was pleased with. However, the second race was not so good as I started and finished 14th. I felt the weekend started off well but I struggled to develop the car as the weekend progressed due to my inexperience and I slowly lost pace as everyone else picked it up. Treacherous conditions at Brands Hatch. Photo courtesy of Mike Hoyer/Jakob Ebrey Photography. With Silverstone under my belt it was on to Brands Hatch for the first round of the Winter Series. Building on my experience from Silverstone I felt that on the driving side I was up to speed quickly. However the challenge as always is getting the right car setup, and at Brands I started to feel I was making headway in understanding the car and what it needed. I can really see how this experience I have gained will certainly help me next year. Most of the running I did at Brands Hatch was wet. It was great to get some extensive wet weather running. I learnt a lot about car setup in the wet and we improved the car as the week went on. By the last practice I was quickest which really helped my confidence. Unfortunately, qualifying was the first time it was dry, so it was quite hectic trying to get the best out of the tires in the first few laps. The first race was also dry, I started seventh finished fifth, so I was quite happy. The second race was wet and I started fourth but unfortunately spun in Graham Hill Bend (lucky it was not on Brabham Straight!!) and I fell all the way back to last, but the car was really fast and I managed to come back through to finish fifth, which was a great result. But I was disappointed about my mistake on the first lap because I felt I had a chance to win. Being at Brands for the first time was really cool and I really enjoyed the track. It is by far one of my favorite tracks now, and it was awesome to race down the main straight named after Grandpa. Rockingham started off well; we had a lot of practice before qualifying which really helped me. We were constantly improving as the week went on and I was quickest in some of the sessions. It was dry all through testing but qualifying was wet. We couldn’t quite get the pace we had at Brands Hatch as the track was quite different. I qualified eighth and ninth for the two races which I was quite disappointed with. The first race was wet and I managed to get up to fifth position right before the end. Unluckily, I spun with a few laps left and fell back, and ended up finishing ninth. In the second race we decided to go with slick tires even though most of the field were on wets. The track was still wet in the first few laps but I managed to survive and after that the track started to really dry out so I started moving up through the field. But overtaking the leader was another story!! This is when I really learned how cutthroat the racing is in England. I tried several times to take the lead but was driven off the race track each time. I had one final attempt in the last corner but was punted into a spin. I recovered to finish second but was disappointed not to get the win. With Cliff and Michelle Dempsey. It was great at Rockingham to finish on a high note as everyone in the team had been working so hard. I was aiming for a podium finish, and to get one right at the end made it very sweet. I would have loved to have come over and really made a splash in the first couple of races and been up front fighting for the wins. Although that wasn’t the case I was still pleased with how things turned out. It really motivated me to learn as much as possible and soak up as much as I could, to try and speed up my learning curve. I was right in the thick of English racing which was also very interesting and I felt like it improved my race craft a great deal. I really enjoyed the racing and it was great fun. The whole experience was incredible. I can’t thank Cliff and Michele Dempsey enough. They really looked after me well. They were absolutely fantastic people and incredibly nice. I had such a great time with them and I’ll never forget the great memories I have. Jeremy, Cliff, Michele and all the supporters of the program, “THANK YOU” for this great adventure. I had a truly amazing time racing in the UK, and had the time of my life. The experience that I have gained from the program is invaluable. This has been a great stepping stone in developing my career.